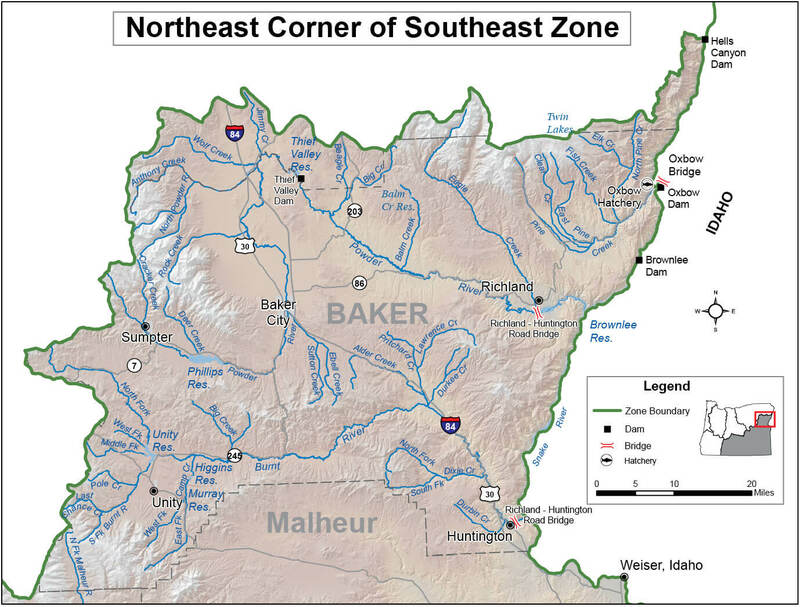 The Southeast Zone is all tributaries (including their impoundments) of the Snake River system above Hells Canyon Dam; the Silvies River drainage in Grant County; all waters in Malheur and Lake counties; all waters in Harney County except South Fork John Day drainage; and all waters of the Klamath Basin in Klamath and Lake counties. 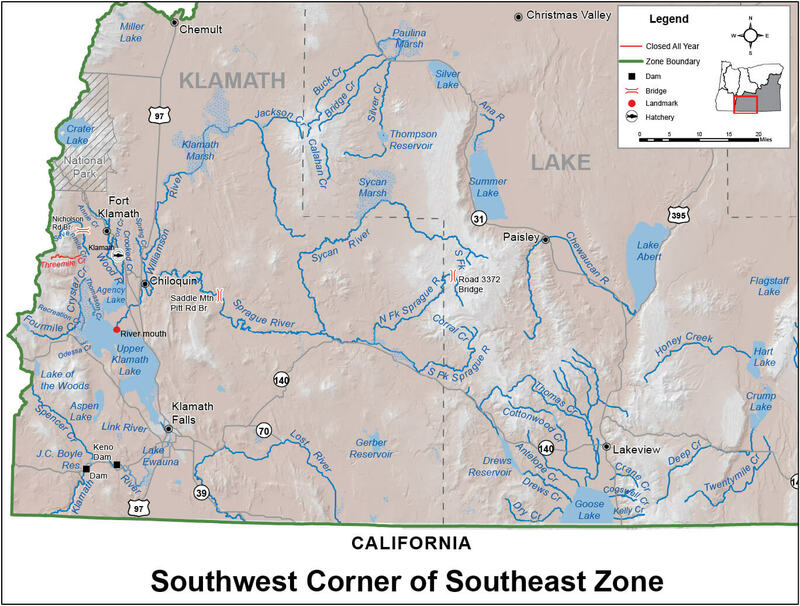 This zone does not include any portion of the mainstem Snake River. The Klamath River Basin is all streams and their tributaries that drain toward Upper Klamath Lake or Klamath River. 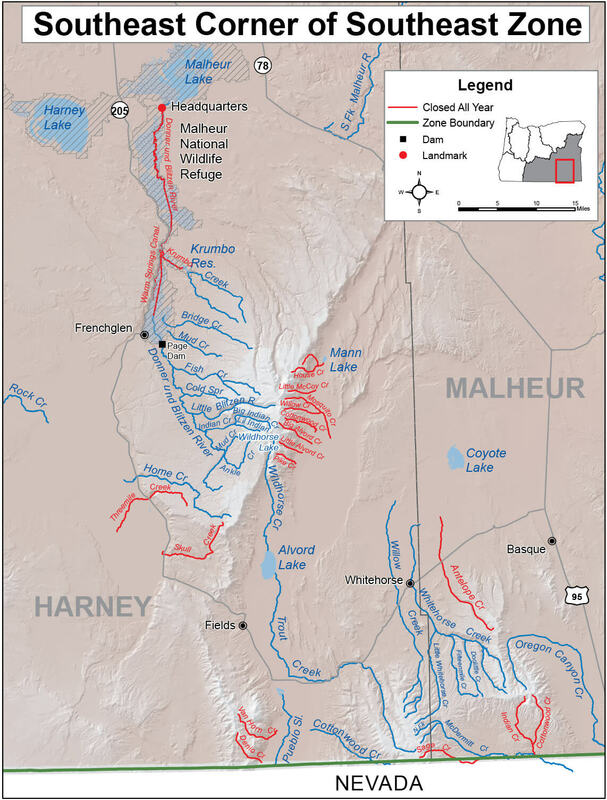 Regulations for the Snake River can be found in the Snake River Zone. Trout Lakes: 5 per day, 25 kokanee per day in addition to trout limits, 3 daily limits in possession. Streams: 2 per day, 2 daily limits in possession. Angling restricted to artificial flies and lures in streams. See Exceptions for streams where use of bait is allowed. No size limit on kokanee. Closed to angling for bull trout. Streams: Open all year, unless noted under Exceptions. 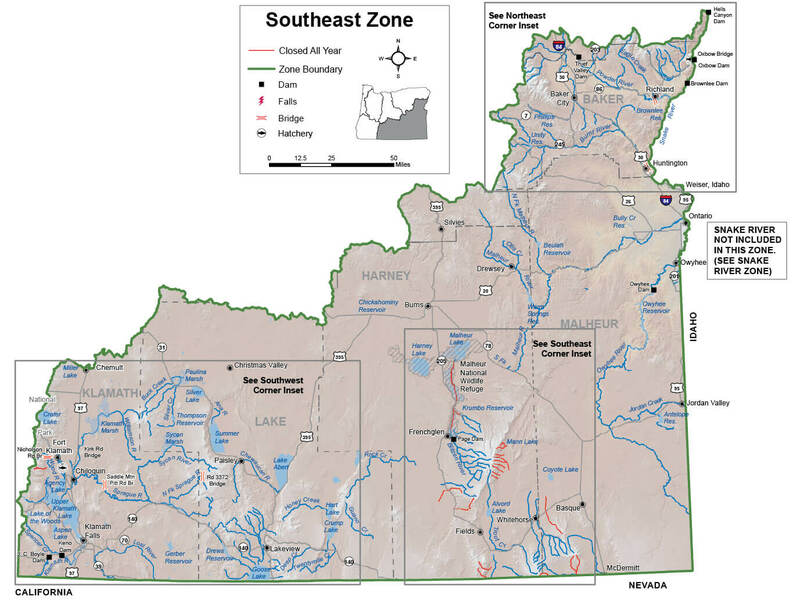 Largemouth and Smallmouth Bass 5 per day, 3 daily limits in possession, except no limit in southwest corner of Southeast Zone (see map below). Angling restricted to artificial flies and lures in streams. No size limit in southwest corner of Southeast Zone. Note: See Exceptions to catch limits, length limits and streams where use of bait is allowed. Lakes and Reservoirs: Open all year. Streams: Open during trout season. and Yellow Perch No limit. Angling restricted to artificial flies and lures in streams. See Exceptions where use of bait is allowed. Lakes and Reservoirs: Open all year. Whitefish, Sucker, Northern Pikeminnow, Carp, Chub, Sculpin, and other Nongame Fish No limit. Closed for suckers in the Southwest corner of the Southeast Zone (see map). Closed to take and possession of Protected Fish (see item 26 in General Statewide Regulations). See Exceptions for streams where use of bait is allowed. Hybrid Bass No limit. See Ana Reservoir under Exceptions.